Lawry's Bacon and Chive Seasoning is a smoky blend of bacon, chives, garlic, onion and paprika to season all your potato dishes such as baked potatoes, potato skins, or potato salad. Also great with eggs, burgers, chicken, pork, pasta and vegetables. 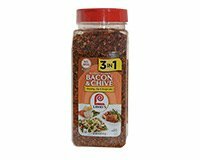 Lawry's Bacon and Chive Seasoning can be used to make a dressing for salads, a dip for vegetables or chips, or as a seasoning for a recipe. Ingredients: Spices (Including Brown Mustard Seed, Paprika, Black Pepper, Thyme), Onion, Sea Salt, Garlic, Demerara Sugar, Canola Oil, Green Onion, Bacon Fat and Cooked Bacon (Cured with Water, Salt, Sodium Erythorbate, Sodium Nitrite), Chives and Natural Flavor (Including Hickory Smoke). Mix mayonnaise, milk and Lawry's Bacon and Chive Seasoning in a medium bowl until well blended. Mix sour cream and Lawry's Bacon and Chive Seasoning in a medium bowl until well blended. Serve with cut up fresh vegetables or chips. Mix olive oil, Lawry's Bacon and Chive Seasoning, and sea salt in large bowl. Add chicken thighs and potatoes to bowl. Toss all ingredients in bowl to coat throughly. Arrange chicken and potatoes in a single layer on a non-stick foil lined or non stick 15X10 baking pan. Bake for 40 minutes or until chicken is cooked through and potatoes are tender, turning chicken and potatoes occasionally.